You can easily make natural baby soap using an organic soap making base and adding 100% organic essential oils. Did you know that most baby soaps on the market are full of chemicals and synthetic petroleum based ingredients? Anything that lists "fragrance" as an ingredient is a synthetic. Even soaps that boast "all natural" are often not what they seem. True all natural baby soap with organic soap making ingredients are available, but they are pricey! Here are instructions for making organic baby soap using the melt and pour technique. No, this isn't truly "making soap" from scratch with lye. This is a process that is beginner friendly! No nasty lye that can burn through your skin, timers or thermometers. This is the easy way! Please note that the soap base you use will determine if it is suitable for a child. There are palm oil, coconut oil, goat's milk, almond oil, hemp oil, etc bases available and all differ in how gentle they are. Please ask your soap base supplier for a recommendation if you are unsure. Materials Needed: Organic soap base, which you buy and it comes in a huge block of soap. I got a 10lb organic block made up of organic coconut and palm oils from a local supplier. 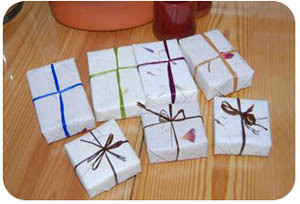 However, I have also purchased soap making materials from BrambleBerry.com and they do carry an organic soap base. Essential oils--add 1/4 ounce per pound of base. Please read up on which essential oils are safe and unsafe for children. 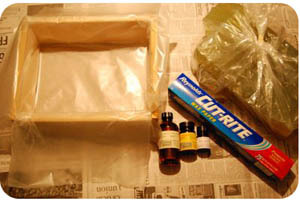 A mold to pour the soap in: pizza box, cardboard box, wood box, shaped molds made for soap, etc. Big pots to melt the soap in and freezer paper OR plastic cling wrap to line your mold. 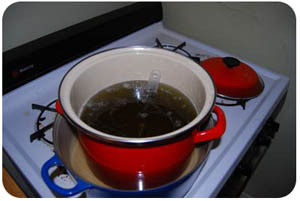 Use a double boiler or fake it by filling a large pot with water and putting a smaller pot inside of it for the soap to melt in. Chop up your soap block into smaller chunks so it will melt faster and evenly. Wait for the water to boil, then toss your soap chunks in your pan, COVER and turn the heat way down to very low. It can take as long as an hour to fully melt but go back and lift the lid, checking on the melting progress occasionally. You can use a spatula or a spoon to stir and to see if all the chunks have melted. Line a cardboard box, mold or pizza box with freezer paper or plastic cling wrap. If using freezer paper, make sure the shiny side points towards the soap. Line it very well, overlapping so there will be no leaks. Alternatively, you can purchase cute little "soap molds" in various shapes which would be adorable for an older child or as a baby gift or as natural baby soap shower favors. Pour your soap into the lined mold and let sit until fully cooled and hardened. This usually takes at least 24 hours. 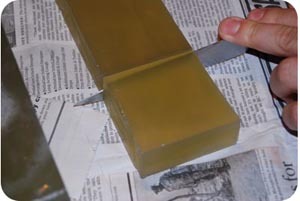 Remove block of soap from the mold and use a straightedge to mark the bars of soap that you'll cut. 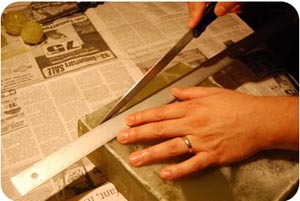 A simple kitchen utility knife can cut the soap bars, but please be careful when cutting. We cut loaf slabs first and then cut individual bars from the loaf. We like to make various sizes (some square and some rectangle) and then wrap them up individually to give out as baby shower favors. 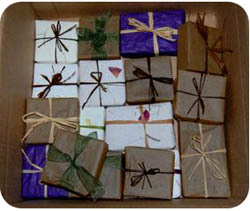 Decorative papers or even unbleached parchment paper makes nice wrapping with a little raffia ribbon. Ones meant to stay in our house are simply tossed unwrapped into a wooden box with a lid to keep the scent fresh. As you can see, 10 lbs creates a LOT of soap. Our costs per bar using this organic soap making technique with organic essential oils was around 75 cents per bar. Enjoy creating soap and remember to make some for you too! Go to the Clean Baby Stuff Section for more project ideas! Back to the top of the Make Natural Baby Soap page.